The Advocates posted a questionnaire with Newsletter Number 14. We had a most acceptable return encouraging both in terms of response and affirming our strategic direction and focus. President, Stuart Crosbie, will publish the results in the next newsletter. Thanks to all who took time to complete the questionnaire and send it to us. The river as a nursery seems to be in good heart. There have been significant numbers of fish through the river this winter with fish in good condition (good shape and orange fleshed) but still struggling to average 3lb though there are fish of a larger size in the catch. It is much better than has been the case over the last couple of years. It is important for us all to understand the food chain and the effects on the fish when the food chain fails. I have hopes that next years fishing will be even better with larger fish coming into the river. The reports and experience of poor fishing in the last few years has meant that there have been fewer anglers this year judging by license sales and competition for fishing spots. Even with fewer anglers I still see examples of poor manners on the river. This may be due to ignorance of angling etiquette that has existed for a long period of time. 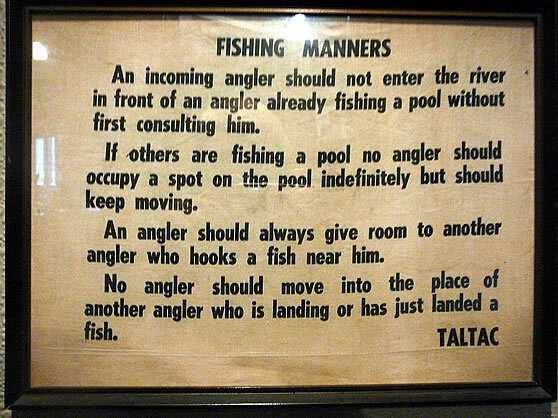 Some years ago TALTAC had signs around the river stating the simple manners on the river. These were attacked by some and have progressively disappeared over time. A copy remains in the Bridge Lodge and is reproduced here. These manners make a pleasant experience for all anglers. Marja ter Haar is leading the campaign to clean up the banks of the river from Te Aho Road through to the Hydro Pool. Using Community Workers she has freed up earlier planting to enable the plants to get well established. There is a little area of gorse around the Hydro pool and it will be good to see that eliminated. They have done a great job and have earned much applause. The Waikato Weedbusters award for 2010 has been awarded to the Advocates for our work in eliminating wilding pines and planting indigenous species along the river banks. We are pleased to be the recipients of this award and some of us will travel to Hamilton on 14th. September to receive this award. The country is in the midst of local body elections with candidates declared and voting to take place later this month. With new councils in place we will be pushing to have a Tongariro River Integrated Catchment Management Plan before the new Environment Waikato Council. With all stakeholders keen for such a plan it remains a disappointment that it has not been achieved.